Bill contacted us on behalf of one of his clients that owned a website for their business – Micro Tester. This is also the same client that owned the Central Coast Billboards website. Unfortunately, the website hosting provider for this individual went out of business several months ago with no notice. Bill’s client found himself with two websites that were no longer online or working. Luckily, we were able to resurrect the old websites for Bill’s customer. We completed the work for Central Coast Billboards several weeks ago. After that was done, Bill’s client then had us proceed with the more elaborate website for Micro Tester. We quickly got to work and restored the site and made a few changes to it (such as getting the contact form working again). Today, Bill’s client has approved the site and it has been published back out to the Internet! 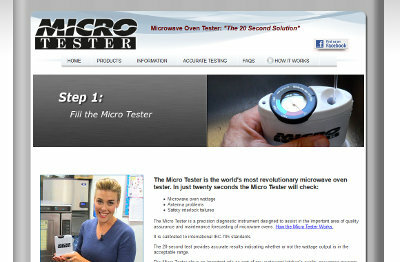 The website for Micro Tester is at micro-tester.com. 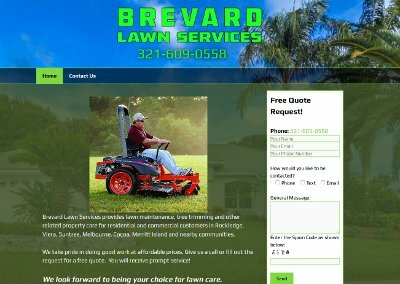 Jamie contacted us a little over a week ago asking to get a website created for his lawn care business that serves Brevard County FL – Brevard Lawn Services. Jamie already had registered the domain name at another provider, but since our service included a domain name at no extra cost with a year of website hosting, he asked us to also transfer over the domain name and manage it on his behalf. While that cannot be done until April (domain name was new – cannot transfer new domain names for 60 days), we were able to get the ‘nameservers’ updated to start working on the site immediately. We gave the website a stylish look that matched the area he provides service in – with a transparent background of a house and palm trees. Jamie didn’t want a large website – just something to get an online presence. In addition, he also had us assist him with getting a Google Places listing setup. We took care of getting his Google Places listing setup and then had to wait for the postcard to arrive. Yesterday, he sent us the needed PIN number to confirm his listing and completed the setup process. His website and Google listing is now completed. Down the road, he may also have one or two other websites he needs as well, so we hope that we have exceeded his expectations to gain that business as well. The website for Brevard Lawn Services is at brevardlawnservices.com. Andy had us create a website for another business just yesterday. We turned that site around in less than 12 hours and had it running. Because of our fast response to him and providing a quality service, he immediately wanted us to create another website for him – Dealer Auto Sales, LLC. He indicated that the site should be different from the prior site we designed but it should have the same feature set (one scrolling page, mobile friendly, with a contact form). We started on the website early this morning and had it completed by noon. Andy approved the site and it is now published and live! 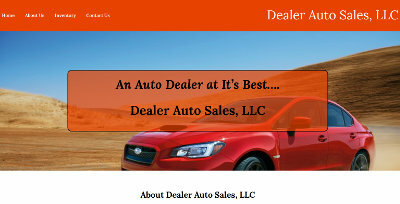 The website for Dealer Auto Sales, LLC is at dealerautosalesllc.com. Tom, the owner of K4K CardFunding, contacted us a little over a week ago. He had used the GoDaddy Website Builder platform to create a website for his business, which he was not satisfied with. He wanted to exude themselves as a larger company and wanted to take their website ‘to the next level’. After a few itemized estimates and communications with Tom, he was ready to get started on the site. Tom was very quick at providing everything he wanted on the website, which allowed us to get the website completed that much faster. On Saturday (slightly over 48 hours since this writing), Tom paid the initial cost to get started. We worked diligently on his website through the weekend and finalized it today. The K4K CardFunding website is now up and running! 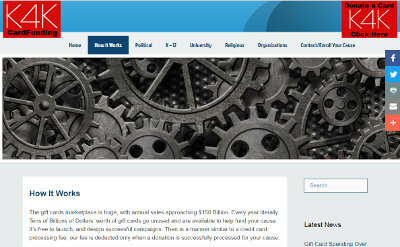 Their site is at cardfunding.org. This weekend, I got outside and just walked around the yard a little bit. It still was a cold weekend, getting into the low 50’s. While walking around, I noticed some leaking coming from the rain barrels. I was a bit in shock, because I didn’t understand why there was water in the rain barrels. I left the ball valve open at the bottom of the rain barrels so any rain we had would just flow out. Pretty nice crack up there! Well, I suspect that the cracked because the water inside may have frozen – at least that is my thoughts. 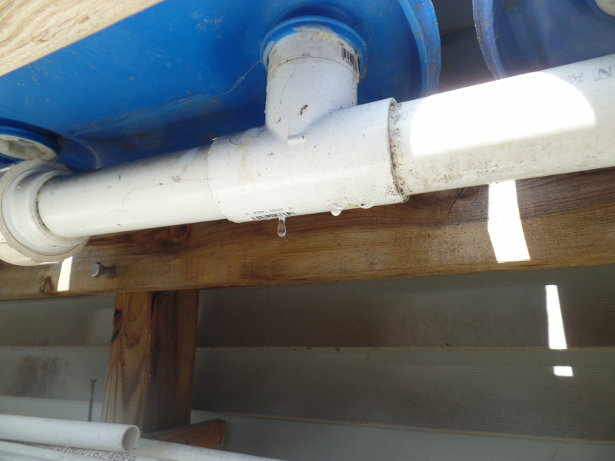 I hooked a hose up to the ball valve – where the water should have been draining out of – and backwashed it. 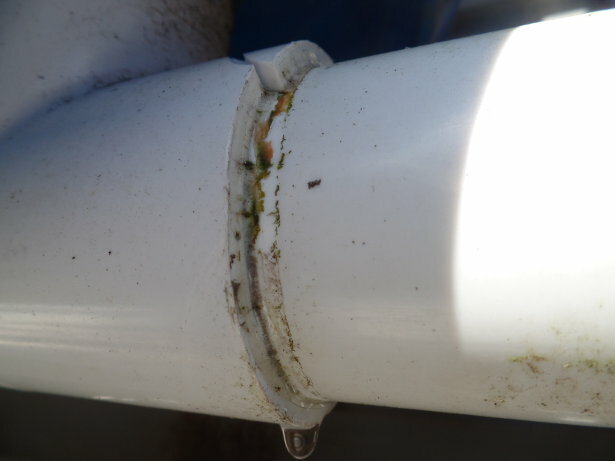 Welp, it looks like some leaves and junk got down into it and that is why it wasn’t draining properly! So then I looked up at the top where the main rain barrel is that has the hole in the top and the gutters all flow into. The filter was missing! So, that explains it. I have gutter guards on the entire house and garage (which is where all of the water comes from) but somehow leaves and some small twigs got into the barrels. 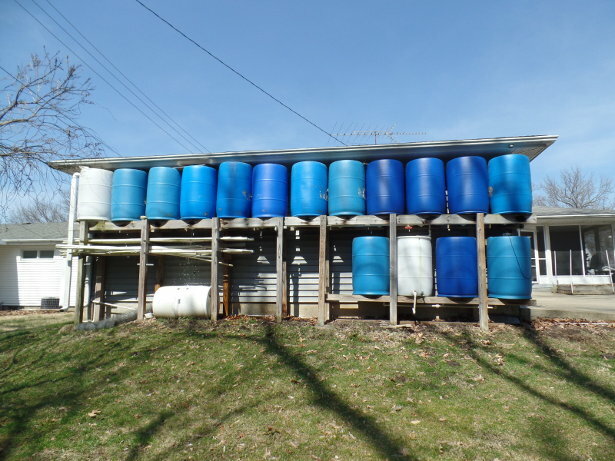 Still – the rain barrels were put up in 2010. Seven years later, they are still doing well and am quite lucky that this is the first time I’ve had to do any maintenance on them. Considering everything is left out to the elements, it is surprising that with as many fittings and connectors there are, this was the first issue. But I won’t complain! So I had to buy a new 5-foot piece of 2-inch PVC pipe, two “T” connectors, two new male-threaded adapters, and four couplers. I wanted to salvage the PVC unions because those things are expensive! So I cut off the bad pipe, put the couplers in, glued everything together, and put it back up. Hindsight says I should have taken a couple pictures of that process to post, but I didn’t. Now the test will be to see if it holds water or if there will be any other leaks. Probably should close the ball valve since we are expecting a little bit of rain this week – and see if there are any other leaks elsewhere. OK, moving on from the rain barrel repairs. The lettuce has all sprouted! Very good germination again. I planted 12 seeds each of four varieties and the majority came up. 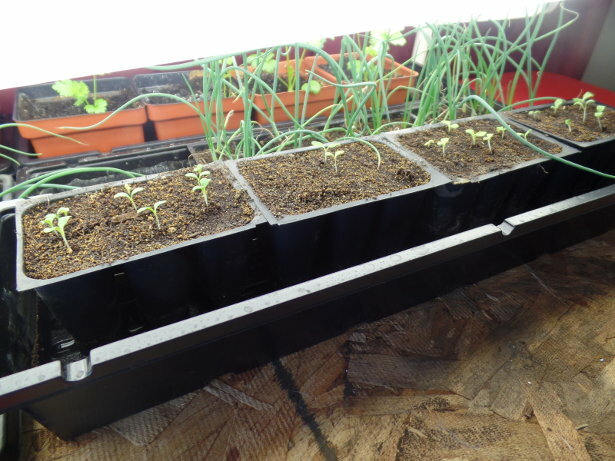 There is one variety (second from the left) that didn’t germinate very well. Only about two of 12 seeds came through. There were about two others that germinated but didn’t seem to last. Not fully sure what variety that is, but I am wondering if it is the New Red Fire lettuce. I’ve always had fairly poor germination out of those seeds. But, I planted some Simpson Elite, Buttercrunch, New Red Fire, and Red Salad Bowl lettuce. Wanted to start this year off with immediately trying to get 12 total lettuce plants in the garden. In year’s past, I would do one of each variety – and would do that every couple of weeks. That way they were staggered and would potentially provide a couple weeks more of lettuce. But that didn’t really pan out – because it starts to get fairly hot in June (too hot for lettuce anyways) and they all bolt / turn bitter right away. 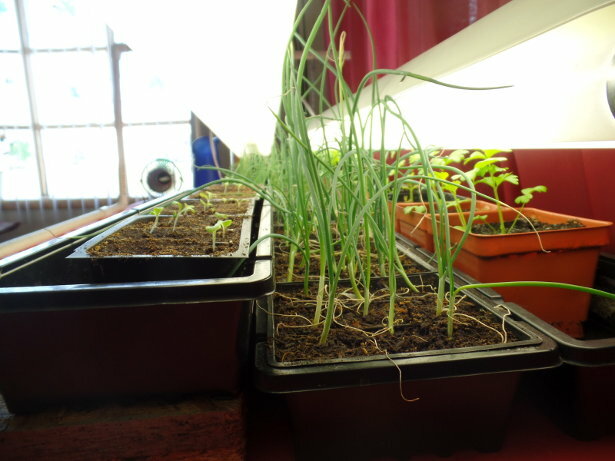 And another photo of the germination station – shows the older onions, celery, and some of the lettuce. 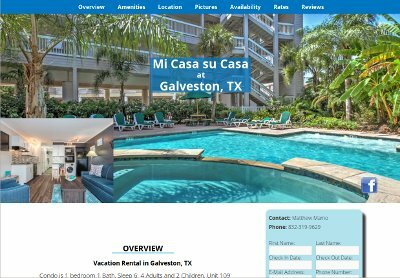 Matthew, a current customer of ours that owns and operations Team Mamo Realty, contacted us about a new opportunity – creating a vacation rental website design for his condo in Galveston, TX. Matthew already had an AirBnB listing but wanted to also branch out and make his own website. Because he already has access to credit card processing, he wanted a site that would allow inquiries where he had full capability of receiving the payments without being charged a commission from other websites for taking rental bookings. We showed Matthew a couple of other vacation rental websites we created and he liked the design and layout that we had setup. We added the information about his condo along with the pictures and he had a completed product! His website makes use of an SSL security certificate so he can accept sensitive data from clients on the booking form. When someone fills out the booking form, he receives a “template” email with their information and other pre-populated boxes. He simply fills in the boxes with the amounts and sends it back to the interested party. Inside the email is a link back to his website for the page with the rental agreement and credit card form to complete the transaction. In addition, his website seamlessly integrates with his AirBnB calendar. Once a day, his website will refresh the calendar on his website to the calendar on AirBnb – that way he only has one calendar to manage. We appreciate the continued business from Matthew and the trust he has placed in us to manage his website service needs! The vacation rental website design for Matthew’s condo in Galveston TX is at leasemygalvestoncondo.com. Jenny Morgan, a current customer of BsnTech, called in about 7 pm this evening (March 15, 2017). She noted that she was opening a new office in San Angelo TX for her psychic service business and needed another site. She explained that she wanted the site to be the same as her current site (lovepsychicjennymorgan.com) but needed the address and phone number changed along with a new domain name. Since she just needed the site copied with a few changes done, we provided a discounted website cost to her. Upon payment at 7:15 pm, we got in action right away. The domain name was registered, the website was copied, and the changes done – all within 45 minutes. 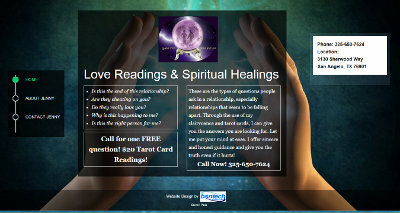 Her website for San Angelo Psychic is now up and running! We appreciate the continued business and support from Jenny. It shows that we are exceeding customer expectations and provide quality services at an affordable price. The website for San Angelo Psychic is at sanangelopsychic.com. Edwin, the owner of Eddy’s Time Services – saw our listing on eBay advertising our low cost website design services. He is the the first customer to purchase a website through us on eBay! We got Edwin’s order and began working with him to understand what he was looking for. Based on the price point that Edwin chose, he wanted a bare-minimum website with no frills or features – just a site with up to three pages of text and graphics. He sent us over the information and within 24 hours, we had his website mostly completed. A couple of small changes were done and the website was done! We appreciate the business from Edwin and hope we exceeded his expectations. 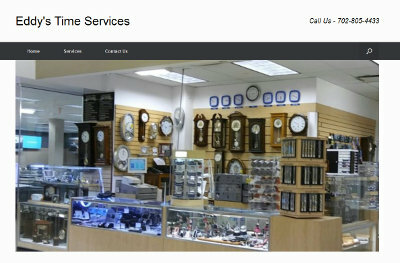 The website for Eddy’s Time Services is at eddystimeservices.com. Victor contacted us over the weekend. He was not happy with the website that was made using a competitor’s website builder. He noted that they were ready to take their business to the next level and get a more professional looking website – along with some assistance with doing some search engine optimization (SEO) marketing. Victor had us take over the website hosting along with their domain name – that way everything is easily taken care of through one provider. Upon getting the specifics, we had the website up and running within 48 hours. Victor was very pleased with the professionalism of the website they received and noted that they will most likely be adding on to the website at a later date. But their primary objective was to get a better-looking website and immediately start the SEO services. Today, the website was approved and their order for the first campaign of SEO was completed. Currently, they were not ranking in the top 200 of the search engines. We will see what success we have after the first campaign – which usually takes about six weeks. We appreciate the business from Victor and look forward to helping him over the long run! 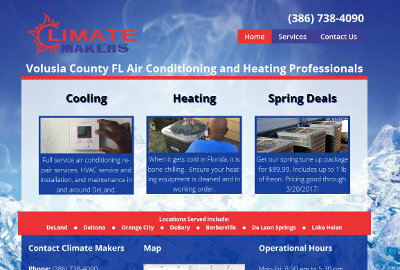 The website for Climate Makers of Central Florida is at climatemakersac.com. Anthony, the owner of Anchor Coast Inspections of Sarasota FL, contacted us to get a website made. A few days ago, we posted about the completed logo design that he approved. Over the weekend, his website was also approved and published. The website has a very stylish and professional design with the information initially provided to get the website up and running. Later on, Anthony may be adding additional capabilities to the site. In addition, we assisted Anthony with setting up a basic Facebook page for his business as well. The website for Anchor Coast Inspections is at anchorcoastinspections.com.